The Smart Planet Mini Cupcake Maker is an excellent way to bake small cupcake and muffin treats for the whole family! The compact maker can be tucked away in a cabinet or kept on the countertop without taking up any room. Best of all, you can use any store-bought cupcake or muffin mix, with a never-ending palate of flavors to choose from. The Mini Cupcake Maker bakes cupcakes or muffins in five minutes, perfect for a sweet treat that isn’t over the top. You don’t have to worry about heating up the oven or cleaning up a mess. The cupcake maker heats up within minutes and the nonstick surface prevents the batter from sticking. Clean up is a breeze and even young kids can help, making this a family-friendly activity. The cupcake maker can also be used with any mini-sized cupcake wrappers. Cupcake makers have been around for quite some time, with a popular brand being Nostalgia Electrics. Most reviewers prefer the Smart Planet maker however, because it is safer to use and doesn’t create a burning smell. That being said, reviewers warn parents to supervise children at all times, as the machine gets very hot while baking. In general, ratings from owners are positive, with very few complaints about the product. Bake delicious cupcakes or muffins in only 5 minutes. Uses standard mini-cupcake paper wrappers for ease. Easy to use with boxed cake mix or your own favorite recipes. Non-stick surface releases cupcakes instantly and makes clean up a breeze. Make incredible homemade cupcakes or muffins with less energy and in less time. Be aware a cloud of hot steam rises if the lid is lifted prior to a completed cycle. For some unit produced cupcakes in 8-10 minutes not reported 5 minutes. Some owners have had trouble getting the cupcakes to brown as they should, yet most agree this mini cupcake maker is the perfect way to bake small treats in any flavor you desire! Please share with us any of your questions or comments concerning this Mini Cupcake Maker review! 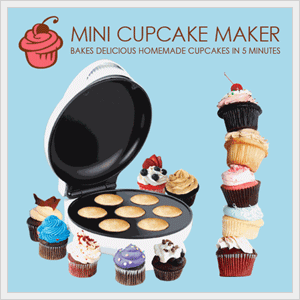 Here’s the manufacturer link for the Smart Planet MCM-1 Mini Cupcake Maker.